Fitness apps have become an essential part of almost any workout routine. But choosing the best one for your needs can be difficult. There are new ones constantly arriving that threaten, or promise to be better than anything else currently available. Being aware of the best fitness apps of 2019 will give you an idea of the options that are currently available. It should be noted that there are some apps that claim to be the best at everything. However, you’re more likely to get the best app for your particular activity if you’re prepared to download and try several different ones. Put simply, it’s just like any area of industry. There will always be specialists that know a particular market better than the competition. When it comes to the best fitness apps you need those specialists; that will ensure the app does everything you need it to and more. This is a great opportunity to introduce you to the Fit Father Project. In short, we help men to eat better and become more active. Of course that's an oversimplification. We cover a wide range of topics from intermittent fasting, to muscle building smoothies, to acupuncture and hypnosis. The truth is that we have helped thousands of men lose weight, feel better, and gain more confidence. For the ladies, it is important to mention our newly launched sister site, the Fit Mother Project. Check out one of the latest articles, the Best Weight Loss Supplements for Women Over 40. Without wasting any more time lets’ take a look at what is currently on offer and how it can benefit you to achieve your goals. A fitness tracker is designed to help you monitor your fitness and, ideally, see how it improves. It should offer to monitor your heart rate, count the steps you take, estimate calories burned, and even monitor different exercise activities. You can, of course, use the app that comes with your fitness tracker. But, you may prefer to use the Strava app. This is a great app and very easy to use. You can monitor your heart rate, distance traveled, calories burned, and list your exercises and workout sessions. The newest feature on this app is Route, this allows you to record a route to be used again, and easily compare performance. Alternatively, you can choose a new route, even one that someone else has posted. The great thing about this is not that you know where you’re going; you probably already know that. It is actually that any section on the route can become a personal race track and your fitness tracker will relay the information to Strava; which will assess, break down and compare your routes, times and performances. It’s a great incentive to get fitter and beat your own times. It should be noted that there is a free version of app, as well as many variations. It should be excellent at keeping you motivated to exercise. You’re not just racing yourself, you’re competing with everyone else in your community. Counting calories is one method that many people use to lose weight. However, you can also use it to build muscle. The trick is to know your maintenance calories and then calculate how many more or less you need to be consuming to move towards your goals. That part is fairly easy, what is harder is actually counting those calories, especially if you eat out or grab food on the go. Fortunately, MyFitnessPal can handle this for you. It has an easy to access food diary. You’ll need to enter all the food you eat on a daily basis. It has its own database of over 6 million foods, you can usually find something to match what you've eaten, allowing the app to calculate your calories for you. It is then easy to monitor your calorie count, see where you are making mistakes and how to improve; as well as tracking your long term progress. You’ll need to enter a few personal details in order to get the most out of this app. However, you’ll be able to assess your micronutrients as well as your calories. You can also monitor activity levels, making this a pretty good all around app. Meditation is a great way of stepping away from all the everyday stresses that life throws at you. Unfortunately, it can be difficult to find the time or focus on your meditation with so many distractions. That’s where Headspace comes into its own. You can access a free version of this but you’ll need to subscribe to access all the different modules, ($12.95 per month). It is very easy to use but has an array of customizable options and uses animations to help explain the concepts involved. It will provide you with downloadable sessions that will guide you through the process of setting up and practicing meditation; it’s straightforward enough that even your kids can do it. The fact that it is scientifically backed is a bonus. However, you do need to be prepared to put in the time in order to get the maximum amount of benefit from this app. Your initial, free course, has 10 sessions of 10 minutes each, you unlock the next session by completing the one you’re on. It’s even possible to track your progress and total meditation time. If you follow the tips you’ll quickly be meditating for 10 minutes every day, and feel the benefits. When you sleep your body has the opportunity to relax, balance your hormones and repair any damage that has occurred during the day. This is the time when most muscle growth and repair will occur. In fact, getting between 6-8 hours sleep a night will help all aspects f your mental and physical health. But, not all sleep is equal, throughout the night you’ll cycle between deep sleep and light sleep. To really understand and benefit from your sleeping you need to start using the Sleep Cycle app. The idea is to show you your cycle, regular sleep has small troughs of deep and light sleep, culminating in deeper troughs. It is normal to alternate between deep and light sleep. However, what is annoying is waking up in the middle of a deep sleep cycle, it will leave you feeling jolted and harassed from the moment you wake up. The idea behind Sleep Cycle is to do more than show you what your sleep is like. You can also set an alarm telling it when the latest time is that you need to be up by. The Deep Sleep app will monitor your sleep and wake you up as close to this time as possible while you’re in your lightest sleep stage. This will help you to feel good when you wake up and make the most of the day. Of course, you’ll also be able to monitor your sleep patterns over time and discover what you can do to improve them. Getting the right workout scheduling app can be difficult. You need something that does more than just allow you to record when to workout. The Strong app seems to offer the right balance between easy to use and motivational; making it the perfect choice for any man. It is technically free, but you only get 4 workouts for nothing. After that, you’ll need to pay $4.99 to unlock everything else. The great thing about the Strong app is that it is so well laid out and easy to use. Simply select your routines and then select the exercise you want to do. You can add extra exercises if you can’t find them on the app. It is then possible to compile your own workout and schedule your timeslot to do this workout. The app will remind you when it is time to start and guide you through the exercises you have selected. You’ll then be able to review your progress and even pin a weights chart to the app, helping you to see your improvement. It is possible to simply accept the workout offered by the app. This is a good way for beginners to get started. It even shows you how many reps you should be performing and at what level to warm up before you start the actual workout. Intermittent fasting is an effective and fairly simple way to boost your weight loss goals. However, you’ll need to track your calorie count on your fasting days and know when you can and can’t eat. This can become confusing when you’re busy; especially when you’re trying to work out what to eat as well. Fortunately one of the best fitness apps of 2019 is Bodyfast. which is designed to help you with your intermittent fasting. The BodyFast coach will work out an individual plan for you, dependent on your goals and current health stats. The methods it uses are scientifically backed and allow you to eat normally, providing you pay attention to the intermittent fasting rules. It will guide you through when o eat and when not. The great news is that this app really is free, you can download it to Android or iOS and start using it straight away. The charts showing your progress are inspirational and the clear week plan helps you to know where you’re at. Sticking to it will help you to achieve your weight loss goals. Weightlifting is a great way to burn some extra calories, even when you’re resting between exercise. It also helps to build muscle which can help you to get the body you want. But, you’ll need a little help to make sure you’re doing it right. That’s why you’ll be glad to find Fitbod, one of the best fitness apps in 2019. Fitbod is designed to allow you to input the exercise you’re going to do; based on the equipment you have available at your gym. If you don’t have the equipment to do an exercise it can be easily removed from the routine. You’ll need to tell the app whether you want to focus on cardio or strength; it will then monitor your workout, provide you with a guide as you go through it and show you when your next one is due. You can even select the routine that doesn't require any equipment. Fitbod is even capable of providing you with a suggested exercise routine that protects the muscles that have been worked and are still recovering. Perhaps most importantly, this app gives you detailed instructions and a video to ensure that you get the form and posture correct. All you have to do is position your phone where you can see it and the app will show you what you need to do. You have complete control over the number of sets and reps but Fitbod will make suggestions for you. In addition, weekly emails, progress reports, and reminders of upcoming workouts will help you to stay motivated. You can choose any or all of these best fitness apps 2019 and add them to your phone. But, in order to achieve real results, you need to be dedicated to a schedule, which can be hard to create and stick to. After all, life is generally very hectic; it can be easy to book the time but difficult to actually complete the workout. Fortunately, this isn't an issue if you join the FF30X today. The reason is simple, you’ll be joining thousands of other men who have already achieved their goals, or who are working towards them. You’ll be motivated and inspired by them. But, you’ll also feel accountable. Sharing your results is one of the best ways to ensure you stick to your workout regime. After all, no one wants to say they didn't do anything or have gained weight instead of muscle! Hopefully the best fitness apps of 2019 will help you to monitor and achieve your results, but the support felt when you join the FF30X program and select the right nutrition. Will be the deciding factor in achieving your goals and becoming the man you want to be. Your new friend & health coach, Stuart Carter Head Training Staff, The Fit Father Project Brotherhood Nickname: “The Fit Brit” Bragging Rights: 16 Years in the fitness industry, Author of ‘The Easy Fitness Guide', Father of 4 boys and Husband to a Venezuelan beauty. *Please know that weight loss results & health changes/improvements vary from individual to individual; you may not achieve similar results. Always consult with your doctor before making health decisions. This is not medical advice – simply very well-researched info on the best fitness apps in 2019. Have you ever had a particularly good session in the gym and grabbed a bar of chocolate on the way out, to celebrate? It’s one of the most common weight loss mistakes and one that I’m guilty of over and over again! I’m getting better at resisting that temptation because I know how bad it is for my weight loss goals. But there are plenty of weight loss mistakes to make. Perhaps the biggest weight loss mistake is to try to do it alone. The support and accountability that friends and family can provide is extremely beneficial for almost any project. FF30x is a weight loss program that's designed to give you an edge from day one. The support, accountability, and guidance have helped thousands of men transform their bodies and lead a healthier life. The first thing you probably do when wanting to lose weight is to take a look at the scales. Knowing where you stand gives you a base figure and helps you calculate how much you want to lose, enabling you to track that loss. If you’re exercising to lose weight then you may also be increasing muscle mass. The scales won’t be going down, but you’ll be healthier. If you’re not even exercising then looking at the scales too much can take away your motivation, especially if they don't go down as fast as you want them. Either option is likely to damage your ability to achieve your goals. Instead, weigh yourself just once every two weeks and take measurements of your waist, thighs, arms, and chest. The change in these will show you how your body is really changing. Counting calories can seem like a great way to eat less than your body needs. You’ll need to discover your maintenance calorie amount so you know how much to eat. While counting calories can be helpful to some people, being obsessive about calories could have a negative impact. A much better tactic is to have a good understanding of the amount of calories are in the foods you eat. Skip the obsessive calorie counting. Instead, focus on eating healthily when you’re hungry. Exercise burns calories, that’s generally a good thing for weight loss. But if you exercise too much, you’ll increase your chance of injury, and risk burning out your body. The result will be a long break before you can exercise again. In addition, your stress levels are likely to go up which can negatively impact your weight loss efforts. The solution is surprisingly simple. Focus on 30 minutes to an hour of exercise per day, preferably alternating days between cardio and strength training. Take a couple of rest days if you're pushing it too much. Strength training, bodybuilding, or weight lifting is often overlooked when you’re trying to lose weight. In fact, it is the most common of weight loss mistakes among older men. The theory is that you don’t want to bulk up, you’re trying to lose weight. But, the reality is that strength training increases your metabolism, burns more calories, and improves your ability to do other exercises. The effects of strength training last long after you've finished your workout. For weight loss, choose some exercises that allow you to focus on upper body one day and lower body another. You should be aiming for 10-12 reps and 3 sets with the maximum weight you can manage in order to complete all the reps.
Don’t be ashamed to start light and build up; it’s better than getting injured on your first attempt. It can seem like a no-brainer to choose low fat, low sugar, or even no-sugar foods. Unfortunately, those foods are still processed and the sugar and fats are replaced with sweeteners and artificial flavorings. They can actually be worse for your waistline! Instead, check out the perfect plate eating method. The aim is to make every plate ¼ protein, ¼ carbohydrates, and ½ vegetables. Once you perfect the approach you’ll even find you can prepare meals in advance; saving you time and reducing temptation on a daily basis. Protein is essential for your body. It is an important part of the process of repairing muscles and it can help you to feel fuller for longer. This will reduce your desire to snack. However, too much protein will be stored as fat, increasing your weight. On the other hand, too little protein is likely to leave you feeling hungry at the wrong times, which leads to snacking. Fortunately, adopting the perfect plate approach to eating, as mentioned above, will help to ensure you have all the nutrients your body needs. Dieting is incredibly popular. But, most diets are designed to be extreme, which can encourage weight loss. The problem is that once the weight has been lost, or partially lost, you’ll return to the way you used to eat. This will result in your gaining all of the weight back. In fact, as many as 65% of dieters will actually return to their pre-weight loss figure or higher, at some point after finishing their diet. The answer is actually simple. Don’t go on a diet. Instead, make small changes to your eating habits which make you eat healthier. If you do these gradually they will simply become part of your lifestyle and will be sustainable for life. A little alcohol is good for you. Experts recommend no more than one drink a day to maximize health benefits. The problem is that for many men one drink turns into several. It’s courtesy of socially acceptable norms. In short, a man can’t go out for just one drink because it doesn't look manly enough! But don’t forget that virtually every drink contains calories. There is no point in spending an hour or more sweating in the gym if you’re simply going to drink those calories back on in ten minutes. Give yourself a limit when you’re going out drinking. If you can’t stick to one then add water between drinks; it will help you feel full and slow down your drinking rate. In addition, you can opt to be the designated driver, or you can choose not to go out every night. There are plenty of other things you can be doing with that time! The human body is approximately 60% water. You need to replenish it regularly in order to flush toxins out and help your organs and cells function properly. Water can also help to keep you feeling full, reducing the likelihood of your snacking when you shouldn't be. But that’s not all! Water is also a great option whenever you feel hungry. The modern world is used to instant gratification. This has led to an assumption that you’re hungry even when you’re actually just thirsty. Every time you feel hungry drink a glass of water. If you still feel hungry in 15 minutes then you really are hungry! This won’t just reduce your calorie count, it will also help your mind to learn the difference between hunger and thirst. Working out is great. Whatever activity you choose to do there is nothing so satisfying as successfully reaching the end of your exercise routine. You’ll know you've been burning the fat and making yourself healthier. But, if you do the same workout every time you’ll be surprised by how quickly it loses its effect. Your body is very good at adapting. Running the same route for 30 minutes every day will become predictable to your body and it will adjust to accommodate it. You won’t burn the calories you think you are and you won’t get the benefit you want. Instead, try alternating strength training and cardio, mixing up the exact exercise as you go. Feel the burn, it will show that it really is working. Sleep is essential for so many of your body’s functions. It is when your body balances it’s hormones and repairs any damage to your body. Two hormones that are affected by sleep levels are ghrelin and leptin. Ghrelin’s role is to control your appetite. The more ghrelin you have in your body the hungrier you’ll feel. Unfortunately, if you don’t get enough sleeps you’ll wake up with high levels of ghrelin. In contrast, leptin makes you feel full. The higher the level of leptin, the fuller you’ll feel and the less need there would be for food. Again, leptin levels increase while you sleep; not getting enough sleep is going to make you crave food more during the day. Set yourself a bedtime and make sure you can get between 6-8 hours of sleep every night. You’ll feel much better for it and your weight loss will improve! Finally, it can be tempting to stop eating regular meals and start consuming smoothies. After all, many celebrities tell you how fantastic and effective these things are. Unfortunately, the truth is that a liquid diet is not going to keep you feeling full; leaving you more like to graze or give into temptation. In addition, if you’re on a liquid diet you’re going to notice the difference on the toilet. As they say, you are what you eat; if you’re only drinking liquid then that’s what’s going to come out. Smoothies can be healthy as long as they don’t have too much sugar or added sweeteners. But, they should be an accompaniment to a small, but healthy, meal or snack. Too many men wait for too long to ask for help. Asking for help doesn't feel masculine. But, the simple fact is that you don’t know everything and nor should you! You probably wouldn't dream of trying to do the company taxes, there are professionals for that. Equally, there are professionals in weight loss. You can learn the weight loss mistakes to avoid and it will help you reach your goals. But join the FF30X program and you’ll have everything you need to become the man you want to be. *Please know that weight loss results & health changes/improvements vary from individual to individual; you may not achieve similar results. Always consult with your doctor before making health decisions. This is not medical advice – simply very well-researched info on weight loss weight loss mistakes. In this article we're going to walk you though some of the most efficient leg workouts for men, but we will also attempt to encourage to work your legs more often. The leg muscles are among the largest muscles in the body. Their size and strength are exceedingly important for a variety of reasons, which is why it's so unfortunate they're one of the most overlooked muscles in the body. Here at the Fit Father Project, our biggest focus is to help men lose weight, build muscle, and feel better. Our most popular program FF30X, has encouraged thousands of men to live happier, healthier lives. Believe it or not, leg workouts are one of our most powerful tools. A regular leg routine is easily one of the best things you can do to gain more strength, burn more calories, and improve your fitness. It stands to reason that if you want strong legs you’re going to want to do the most efficient leg workouts for men. You may be surprised to learn that the latest research has linked neurological health with the signals sent to the brain by your leg muscles. These signals to your brain are just as important as the signals your brain sends to your muscles! The study specifically looked at the effect of reduced muscle mass on the nervous system and found that people who lost leg muscle mass also experienced a negative impact on their nervous system. Virtually every leg strengthening exercise you can think of requires you to balance and support your own weight, and usually the additional weight of a pair dumbbells. This means you aren't just building leg muscle, you’re also strengthening your core and improving balance. In short, you’ll be better able to perform other exercises and be less likely to fall over. You may not think of leg exercises as cardio but they are. The fact is that the blood has to be pumped around your extremities faster than normal. If the exercise gets your heart rate up, but you're still able to hold a conversation, then it’s a cardio exercise. Most leg exercises fall into this category. Your leg muscles are the biggest group of muscles in your body. A compound exercise that involves multiple leg muscles will burn more calories than any other exercise. In addition, your strengthened leg muscles will be larger and burn more calories at rest than they used to. A pound of muscle burns approximately 5 times more calories than a pound of fat, even when resting. That has to count towards your weight loss goals. If you already suffer from lower back pain then it is important to choose your leg exercises carefully. Most exercises involve the back, which is why you need to do them properly in order to avoid injury. If done correctly, you’ll strengthen your hamstrings, quads, hip flexors, and glutes, effectively reducing the risk of back injury. It’s important not to forget that well-defined legs look good. This can make you more appealing to that special someone, but the crucial consequence is that you’ll feel better about yourself. This will translate into greater self-confidence, which can transform your life as you achieve things that previously seemed impossible; all because you suddenly believe you can. Yes, the right leg workouts for men are that powerful! Most people start doing leg exercises in order to build muscle. Working your legs will help with this, but it will also burn extra fat. The difference is at the resistance level. Low resistance with high reps, (bodyweight for 15-20 reps), will stimulate your body to burn more energy, if you don’t have sufficient in your blood then the fat in your fat cells will be converted to energy; helping you to lose weight. High resistance with low reps, (dumbbells for 6-8 reps), will focus more on muscle growth. This is because your muscles will be pushed to their limits, tearing the microfibers. As the fibers heal naturally, within a 24-48 hour window, your muscles will get larger and stronger. A mixture of the two, doing different compound leg exercises on different days, will help you to build lean muscle while burning fat. The following is a playlist that features our favorite leg exercises for men. They say talk is cheap. You’ve seen the benefits, but what you really need is some exercises to get you started. Check out the following leg workouts for men and try the routines. It will quickly make a difference in your strength, stamina, and self-confidence. Stand approximately 1-2 feet from the wall, then slowly lower yourself into a seating position, as though sitting on a chair. Your hands should remain by your side during this, and your back should rest against the wall. If it doesn't re-position your starting position and try again. Your legs should be bent at 90° with your feet flat on the floor. Hold for a count of 5, return to the starting position and then repeat. To make these more challenging add some dumbbells. Top Tip: Dumbbells are better than barbells for this as you’ll need to maintain balance, forcing you to engage your core. Stand with your legs shoulder width apart, slowly lower yourself down by bending at the knees. You need to keep your back straight but at a 35°-45° angle forwards; if you don’t you’ll fall over backward. Hold for a count of 5 and then repeat. Start with your feet shoulder width apart and a dumbbell in each hand. Move one leg forward, bending it 90° at the knee so that your thigh is parallel with the floor. Your other leg goes behind you, also bent with the knee nearly touching the floor. Hold for 2 seconds and then return to the starting position before repeating with the other leg; that’s one rep.
You should use the dumbbell that fits with your goals, lighter for fat burning, heavier for muscle building. 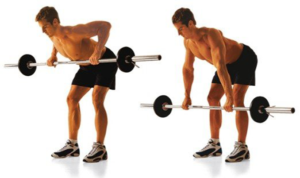 The deadlift is a fantastic exercise that works nearly all the muscles in your body; the key is to get your form right. Place your barbell in front of your feet and stand with your feet shoulder width apart. Bend your knees, keeping your back straight but angled forward. Grip the bar firmly, for safety you should grip one hand palm facing inwards and the other with palm outwards. Lift pushing up through your legs until you are stood straight. Your arms remain straight, the barbell will be approximately waist height. Hold for a moment then lower back to the floor. Stand on a step or the bottom stair in your house. The rear half of your foot should be off the stair. Slowly push yourself upwards onto tiptoes and then back down. You may need to hold on for balance when you first do this. If you wish you can go lower than your starting position and then return to the start point. This is very similar to the standard squat. Your feet start wider apart than a standard squat and you’ll need a kettlebell or dumbbell which is held just below your head, in front of your chest, with both hands. Lower yourself down as you would a normal squat, your elbows can briefly rest on your knees before you drive yourself back up to the starting position. This is very similar to the dumbbell lunge previously described. However, instead of driving your leg forward, you drive it backward, creating a 90° bend at the knee. The difference is that both legs will be at a 90° degree angle. Drive back through your front leg to bring yourself back into the starting position. The real benefit is that you’re less likely to go too far and overbalance and you’re more closely mimicking daily activities, like walking and running. This is a step up from the standard calf raise. You’ll definitely feel the burn with this exercise. Strap a weight to your waist with a belt, so that the weight hangs below your stomach. The first option is preferable if you have a willing partner, if not you’ll be stuck with number 2. You’ll need to stand on a step and complete the same moves as described in calf raises. The real difference is the extra weight. It doesn’t matter how good you are at standing calf raises, you’ll feel the burn. It’s best to do this with a cable machine in the gym or a resistance band. Stand with your feet shoulder width apart and something for your hands to rest on. Then attach the resistance band to one foot, the other end should be secured in front of you, with no slack. Slowly lift your leg so that it is straight behind you, you’ll be fighting the resistance band to get it there. Hold for a count of 2 and then return to the floor. You can swap legs straight away or do your reps with one leg and then the other. This is one that will really test your limits but you’ll need a friend to help. You'll also need a bench in which you can lie flat, with your feet tucked into place, preventing them from moving as you exercise. If you don’t have a foot plate you can use your friend will need to hold your feet in position. It’s worth noting that the more room you have between your knees and the foot pad the easier this exercise will be. Now squeeze your glutes, hamstrings, and abs; forcing your body to bend at the waist and move into an upright position. It’s hard but worth it. Squats – 3 sets 8-10 reps with maximum weight possible. Deadlifts – 4 sets of 8 reps with a 1-minute break between sets. Glute Ham Raise – 3 sets of 8-10 reps, or until failure. Dumbell squat – 4 sets 8-10 reps with maximum weight possible. Reverse Lunge – 3 sets 10-12 reps without rest. Deadlift – 4 of 8-10 reps, the last rep should be nearly impossible for you. Goblet squat – 4 sets 10-12 reps with 1-minute rest between sets. Calf Raises –3 sets of 15 reps with a 60-second rest between sets. Wall Sit – 3 sets of 10-12 reps.
Donkey Calf Raises – 2 sets of 8-10 reps.
You should be feeling inspired to get started with your leg workouts for men right now. I know I am! Inspiration and motivation are great starting points, but if you're ready to take it up a notch, join the FF30X program and gain the support of other men who are working towards a similar goal to yours. *Please know that weight loss results & health changes/improvements vary from individual to individual; you may not achieve similar results. Always consult with your doctor before making health decisions. This is not medical advice – simply very well-researched info on leg workouts for men. Stretching is an incredibly beneficial tool for increasing flexibility and mobility, but there are a number of benefits as well. Stretching for weight loss has become a popular choice for many men wanting to burn a few calories and improve their health and fitness. Stretching is not just about getting your muscles and body ready for exercise. Stretching for weight loss is a real concept that can boost your fat burning abilities and prevent injuries. The risk of injury is potentially higher as you age. But, it doesn't matter whether you’re 20, 40, or even 80, stretching is a great way to decrease that risk. Let’s discover the benefits of stretching and the simplest, most effective methods of stretching every day. It doesn't have to be a difficult routine. If you're ready to kick it up a notch, consider joining FF30X, our most popular fitness program. The program is designed specifically for busy men and uses cutting edge research to help you get fit. Stretching is a form of exercise. You will burn calories while doing it. Of course, you’re not going to burn the same level of calories as a 30 minute HIIT workout. But, you are going to burn more calories than you might think. This is because activating your muscles by stretching them will require additional energy, which is created by burning calories. The actual stretch will burn calories, but the use of your muscles is likely to cause small tears. As these heal your muscles will become stronger; which means your body will burn more calories at rest than it currently does. In turn, you’ll be burning additional calories all day long! Stretching increases the blood flow to all the tissues and organs in your body. This is because you are moving your body, elevating your heart rate and forcing it to work harder, sending more oxygen and nutrient round your body. As part of this process, you’ll feel good about stretching and your body will feel better able to cope with what the day is about to throw at it. In short, you’ll feel in a brighter, more positive mood. It will show in the actions you take throughout the day. You can also try stretching at midday; the movement of your body will reduce feelings of fatigue; helping you to feel more positive and energetic throughout the afternoon. This is another positive result of increased blood flow, caused by the stretching movements. Inflammation in joints and muscles is eased when your natural endorphins, (pain killers), are released. The additional blood flow will ensure that nutrients and oxygen are reaching all the parts of your body, increasing the ability of your body to beat diseases, viruses, and other causes of inflammation. Your joints and any other sources of inflammation will feel much better; especially immediately after a stretching session. Every time you stretch you’ll be warming up your muscles for exercise. However, you’ll also be pushing your muscles and tendons, gently forcing them to do a little more every time you stretch. Put your left hand behind your back with your elbow near your waist. Now, put your right hand behind your back, with your elbow up in the air. See if you can touch your fingers together and inter-lock them. If you can’t, don’t worry! Do this exercise every day, switching arms as you may find that one way you can do it and the other you can’t. Within a couple of weeks, you won’t just be touching fingers, you’ll be able to lock your hands together and gently tug. The higher your metabolism the better you’ll burn calories and the easier you’ll find it to lose or maintain your weight. The great news is that you can boost your metabolic rate by stretching daily. Stretching encourages blood flow to your muscles as they need to work to hold any position you choose. This will gradually strengthen your muscles and help you to burn more calories. Raising your calorific burn increases your metabolism while stretching and for a short while afterward. However, strengthening your muscles means that you’ll burn more calories throughout the day; effectively boosting your metabolism and improving your weight loss results. Top Tip: Don’t forget that stretching and exercise are only part of the equation. To lose weight successfully you need to adopt a healthy eating plan. It doesn't need to be daunting, check out this free 1-day meal plan to see how easy it can be to eat better. The simple act of stretching can offer a profound benefit to your health. The first part of this is the increased blood flow to your organs and the tissues in your body. I've already mentioned this, but it's important to be aware that increased blood flow will improve the operation of these organs. In short, it will help you feel your best and perform better, both physically and mentally. But that’s not all! The increased movement of blood will help to prevent hardening of your arteries and can even lower your LDL cholesterol levels, (the bad cholesterol). Research confirms this fact. There are several ways in which stretching daily can help you to lose weight. Stretching is often seen as something you just do before exercise. While it is beneficial for this it is also an effective way to increase the capabilities of your muscles. Every time you stretch you’ll help to keep your muscles loose, reducing the risk of injury when you exercise and improving your ability to exercise harder. The result is improved performance when you do exercise, increasing the calories you burn and helping you to lose weight; providing you’re consuming fewer calories than your maintenance amount. Alongside your increased performance you mustn't forget that the act of stretching will burn more calories than if you weren't stretching. In simple terms, stretching burns calories, the more calories you burn the greater your weight loss potential. The beauty of stretching is that it doesn't have to be a long drawn-out process. You simply need to commit to doing it on a regular basis. At first, this will take motivation, creating a time slot in your schedule will help. Over a short period of time, this will develop into a habit; which is essential if you want to continue it for the long term. Lie face down on the floor or a mat. Keep your feet together as you place your hands under your shoulders. Push your upper body upwards by straightening your arms; keeping your waist on the floor. To finish lean your head back towards your feet. Try to stay in this position for 30 seconds. It works your abs, chest, shoulders, back, and even your hips. This exercise will stretch and strengthen your back, core, and hips. Start by standing with your feet shoulder width apart. Slowly move your left leg back to create a diagonal line from your waist to the floor. Your right leg should move forward, bending at the knee to ensure your thigh is parallel to the floor. Reach your arms upwards and hold for 30 seconds; you can then return to the starting position and switch legs. You’re probably already familiar with the lunge, however, the side lunge is a great way to stretch your quads, hamstrings, and even your hip flexors. Start by standing up with your feet shoulder width apart. 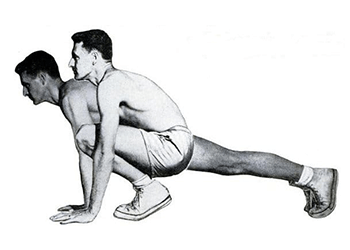 Then lunge one foot to the side, bending your knee to get your thigh parallel to the floor. Your other leg will extend diagonally; without your foot moving. Now lean your body slightly forward, if necessary holding your weight and maintaining balance by placing your hands on your bent knee. Hold it for 30 seconds and then switch legs. You need to stretch your inner thighs and groins. These are some of the most painful injury areas! Start by sitting on the floor, keep your back straight, and your legs in front of you. Slowly bring your feet together. The soles of your feet should be touching each other as your knees go out to the sides. You can then gently push down on your thighs. Ideally, you’ll be able to get your legs to touch the floor but don’t force it; you’ll be able to do this in time. Hold for another 30 seconds. Don’t forget: Any stretch should be pushed far enough to feel the burn but not to feel pain. Lie on your back on the floor with your feet flat on the floor and your knees bent. Wrap your arms around your knees and then bring them towards your chest. Your head and shoulders must remain on the floor. Hold the pose for 30 seconds, you’ll get closer to your chest every time you do this. This is a great way to stretch and strengthen your entire back. You've done your legs, core, shoulders, chest, and back. But, you should also add the tricep stretch. This doesn't just target your triceps. It will also improve your back and shoulders. You’ll need to start by standing up with your feet shoulder width apart. Then, stretch both your arms straight into the air above you. Slowly bring one arm down to the back of your head, bending 90 degrees at the elbow. Use your other hand to hold the elbow in place and slowly pull it towards your head until you feel the burn. Then just hold for 30 seconds before you switch arms. You've probably heard of this and had a chuckle. However, the fact is that it’s a great stretching exercise for your legs, hips, back, shoulders, and even your arms. Plus, no one has to see you doing it! To start you’ll need to go onto your hands and knees, your hands should be a little in front of your shoulders. Now raise yourself up by straightening your arms and legs, keeping your feet almost flat on the floor. Push the heel of your feet towards the floor while tipping your head towards your feet, this will maximize the stretch; again, you’ll need to hold it for 30 seconds. Stand with feet shoulder-width apart and stay relaxed. Place your hands behind your back and lock them together. Keep your arms straight and pull your arms away from your back, staying as close as possible to the line of your bottom. You’ll feel your chest stretching as you hold this one for just 20 seconds. The trick with stretching is that it’s a long term thing. You may only spend 10 minutes stretching in the morning and another 10 in the evening, but if you do this every day, you’ll really feel the benefits. Put it this way, it’s taken you months, or even years to get your muscles tight. You're not going to loosen them with a few stretching sessions. You need to commit to doing stretches daily as this will loosen your muscles, improve your flexibility, and boost your overall health! That’s a good reason to spare 10 minutes a day! Of course, it can be hard to build a habit. To solve this issue, join the FF30X program, enlist a friend to stretch with you, and get all the support and advice you need. You won’t just be better at stretching, you’ll lose weight, build lean muscle, and become the man you want to be. The first step in stretching for weight loss is joining the FF30X, the rest will happen, one step at a time. *Please know that weight loss results & health changes/improvements vary from individual to individual; you may not achieve similar results. Always consult with your doctor before making health decisions. This is not medical advice – simply very well-researched info on stretching for weight loss. There have never been so many options regarding losing weight effectively. The problem is that not all of them are as good as they seem. Other techniques, such as using meditation for weight loss, work much better than they seem from the surface. The Fit Father Project aims to give you access to an array of materials that will support your weight loss journey. Meditation for weight loss is one of those tools to push you in the right direction. This isn't just an opinion. Take a few moments to read this article and you’ll discover the studies that show meditation for weight loss actually works. We're going to walk you through the best ways to start meditating, the array of other benefits it offers, and the top techniques to use. Say the word meditation and you’ll probably picture a monk silently sitting in a seemingly impossible position. Yes, you can meditate like this, but you don’t have to. The important thing to note is that meditation is defined as a means of encouraging a heightened state of awareness and improving your focus. I know what you’re thinking. How can a thousand year old tradition that focuses on the mind help you lose weight? While there have been a limited number of studies into the link between meditation and weight loss, the results are positive. This study is just one that confirms meditation for weight loss really works. When you meditate, the amount of cortisol in your body will drop. Cortisol is an essential hormone as it prepares your body for fight or flight in a variety of different situations. However, too much cortisol in your body is a common issue thanks to the stressful world we inhabit. High levels of cortisol can only be produced when your body diverts resources from the production of other hormones. In short, reducing cortisol levels allows your body to produce leptin, which is known as the appetite hormone. More leptin will decrease your appetite, helping to prevent over-snacking. Of course, the fact that you feel calmer and are better able to make decisions is a fortunate bonus! You already know one of the biggest roles of meditation is to increase your own self-awareness. This means becoming more aware of what your body actually needs and appreciating the good things you already have. You’ll achieve this by simply pausing to focus on yourself and your life. Because we are all so busy, it's easy to forget to take a few moments to appreciate what you have. A greater appreciation will help you avoid the emotional pressures that often lead to over-eating. Instead of reaching for the cookies you’ll be more aware of why you want the cookies. This will help to prevent you from taking them! In addition, increased awareness of your own body will help you to know when you’re hungry or full. You start to recognize the symptoms of real hunger and can respond when you get these. Top Tip: If you don’t know if you’re really hungry, drink a glass of water and see if you still feel hungry after a few minutes. You’ll be surprised by how often you’re not really hungry. Now you know that meditation can help you lose weight and improve your physical and mental health, you’ll want to know how to get started! The first step is to allocate yourself a time-slot. You only need 10 minutes a day, but you must book it into your schedule. Having a set time will increase the likelihood of you actually doing it. It doesn't have to be the same time every day, whatever works best for you. Just make sure it's at a time that allows you to focus on mediation. Find a spot where you’ll have peace and quiet. You may need to tell your family to stay clear of a specific room for 15 minutes. It also helps to choose a location where you're surrounded by nature, but it's more important to be in a quiet place. You need to find a comfortable position to sit in. There is no wrong position but you will be in that position for 10 minutes, so you don’t want your mind to start focusing on how uncomfortable you feel. Once you’re comfortable, set your alarm for 10 minutes. Simply start breathing in and out slowly. You can focus on this breathing or you can focus on another part of your body, such as the rise and fall of your chest. Stay focused on this until your alarm sounds; that’s it! Your attention will wander, especially when you first start meditating. That’s fine. As soon as you become aware it is wandering simply re-focus on your breath and carry on. There is no need to feel bad, as your focus attention will improve over time. Select your preferred meditation podcast and listen to their voice. They will guide you through each step f the journey. All you have to do is focus solely on them and what they are saying. YouTube offers a similar experience to a podcast. It may be serene music, the sounds of birdsong, or a guide to meditation. The effect is the same. Time may appear to be moving slowly and it can be tempting to keep looking at your watch/timer. Place your timer far enough away that you can’t reach or see it and then use a simple hourglass. You can turn it when it has fully drained, but that doesn't mean you have to watch the sand fall. The hourglass is simply a means of controlling your attention and returning it to where it should be. To meditate successfully you need to be comfortable. If you’re not then your focus will keep shifting to your seating position. The perfect answer is a meditation cushion that offers no back support. This ensures you stay alert as you meditate. However, if you’re new to meditation then a comfortable chair will do; it should support your back and be comfortable; even though there is a risk of dozing off. We've already touched on how meditation can lower your stress levels and reduce hunger. However, lower stress levels also mean your body can balance its hormones better and respond to infections. In short, it will improve your health today and in the future. Being more aware of your own body will actually make you more confident. You know what you are capable of and can provide it; even in stressful situations. This will translate as improved confidence. Getting in touch with your body allows your mind to relax, allowing you to make better decisions for your own body. This reduces the likelihood of depression and other emotional issues. Meditation also gives you an increased ability to manage common issues, such as anxiety disorders, depression, sleep disorders, high blood pressure, and even joint pain. Most people reach for the painkillers at the first sign of pain. However, much of the pain can be caused by inflammation, which is controlled by the amount of cortisol in your body. Meditation reduces cortisol, inflammation, and ultimately you’ll feel a reduction in pain and soreness. In short, your body will be better able to manage and regulate itself. Improving your ability to focus on one issue will allow you to absorb information better and perform your daily tasks more efficiently. Yes, meditation can actually help you to learn information and coordinate your body movements! The ability to focus on your breathing for 10 minutes in one go will help you to stay focused on long meetings and other events. This will ensure you absorb the necessary information and can provide positive and useful feedback. You have to be comfortable before you can start. The right chair or cushion is a big step in the right direction. But, you should also consider the temperature of the room and the clothes you’re wearing. All of these should be comfortable, if they’re not they will distract you from your goal. It doesn't matter if you have the sweetest 2-year old, a noisy 16-year-old, or a loving wife that wants to bring you a cup of tea; you don’t need any distractions when meditating. Make sure everyone knows and you’re in a private space. If 10 minutes is simply too much, then don’t give up. Start with just 2 minutes and build your ability over a number of weeks. Meditation for weight loss is not a race. When you start you’re going to be thinking about if you’re comfortable or 100’s of other issues. Tell yourself not to worry and, as Nike say, just do it! You can fine-tune the process each time until you get the perfect scenario for you; just don’t forget that everyone is different. It can be hard settling into meditation the first few times. Use a guide, whether a podcast, YouTube or some other method. It will help you to build your own process and successfully start meditating. Meditation is an individual activity but you’ll be surprised at how much more focused you are when there are 2 or more of you doing it. Find a local meditation group or start your own; it will help. Whether you've meditated for 2 minutes or 2 hours, when you reach your goal congratulate yourself. Simply sticking to it is an achievement and will help you with your weight loss journey. This is a very common myth but one that simply isn't true or generally possible. Your mind is a hive of activity. Simply thinking about clearing your mind will invoke an array of thoughts, preventing it from happening. Instead, just focus on your breathing while trying to control your thoughts. Put simply, meditating is not difficult. The image of a monk on a cliff top sat cross-legged gives it the appearance of being hard. The truth is anyone can do it, anywhere, you just need to focus on breathing. You’ll be surprised at how quickly you feel the effects of your meditation efforts. The first few weeks may not show much benefit as you get used to the techniques. But by week 4 you’ll start to notice it is having a positive effect on your decision making and lifestyle. There are those that report stories of visions, seeing colors, or even hearing spirit guides. This doesn't apply to everyone and doesn't need to. The act of meditation will improve your weight loss abilities and your lifestyle, that’s enough by itself. The first step can often be the hardest, but it doesn't need to be. Learning to meditate is as simple as allocating 10 minutes of your day to being quiet and focusing on one thought. Through patience, the rest will come naturally. It is important to remember that meditation for weight loss is an aid, not the entire product. You also need to be more active and look at what you are eating. If you’re unsure of how to start eating healthier then you can check out the perfect plate approach. It’s simple to do and a very effective way of maintaining a balanced diet. Join the FF30X program today and speak to thousands of other men who've enjoyed success in achieving weight loss and muscle building goals. With our support, you can master meditation, healthy eating, and the right exercise for your needs. *Please know that weight loss results & health changes/improvements vary from individual to individual; you may not achieve similar results. Always consult with your doctor before making health decisions. This is not medical advice – simply very well-researched info on meditation and weight loss. The most effective fat loss workouts for men are those that take advantage of our body's natural ability to adapt to changes. Generally speaking, consuming less calories than you burn in a day will encourage your body to use your own fat as an energy source. But like most things, fat loss is not that simple. The amount of calories you burn while working out typically pales in comparison to your Basal Metabolic Rate. For example, the average BMR is around 2000 calories per day, while a 30-minute workout typically burns around 200-300 calories. If you start your weight loss regime under this assumption, you would think you could burn a couple of pounds per month simply by working out every day. However, if your fat loss workout only includes sitting on an exercise bike for 30 minutes, your body is going to adapt to do the exercise more efficiently, burning less and less calories over time. The reason intense exercises are best is due to the fat burning zone. The fat burning zone is considered to be 60-70% of your maximum heart rate. This is best achieved by exercising moderately hard. Put simply, it’s 220 less your age. Multiply this figure by 0.5 to get your target heart rate for moderate intensity exercise. So, if you’re 40, it would be 220-40 = 180 *0.5 = 90. That’s not as high as you thought it was going to be! In short, moderate exercise is sufficient to lose weight. But, if you’re really serious about losing weight, you need to take this a step further and focus on intensive exercises. At low or moderate intensity your body will burn a set number of calories per exercise. Increase the effort, and you’ll increase the amount of calories burned. The greater the number of calories you burn the more fat your body is capable of burning. But that’s not the only reason you should undertake intensive exercises. This type of training will condition your muscles, helping them to grow stronger and bigger. As muscle burns up to 5 times more calories than fat throughout the day, having more muscle is an effective way to reduce your weight. Research shows that short and explosive exercises provide the best possible benefit in terms of weight loss, as compared to other exercises. The first step in successfully losing the fat is committing to an exercise program. In order for any program to be really effective, you need to turn your initial motivation into a habit. This means creating slots of time and booking them into your schedule. You then need to start working out even if you don’t feel like it. You’ll quickly start to enjoy the challenges of exercise and find yourself wanting to do more. But, in order to prevent the exercises from becoming boring, you need to introduce variety. This can be as simple as choosing a different exercise each day, or it can mean changing your routine on a regular basis. You could even do the exercises with different pieces of equipment; depending on where you are. For example, big dumbbells work for the farmers walk. But, you could also use sandbags, empty water containers, or even battle ropes. In fact, variety is more than just a way to keep you interested and motivated. The variety can ensure you are working all the muscles in your body, improving your muscle strength and fat burn. The great things are that you can add different exercises into your routine on a daily basis. If you’re ready to get started, then try the following HIIT workout, which can be done in as little as 10 minutes. Of course, doing more of each exercise will extend the length of this workout. Try doing each of the following for 25 seconds, pausing 10 seconds between exercises. Once you've completed them all then rest for one minute before repeating them all again. If you’re feeling really energetic you can even do it a third time! HIIT style workouts are very effective but to keep the variety and push your body a little harder. If you’re looking to burn fat, add in some weight training to your routine to increase your lean muscle mass; which will boost your calorie burning abilities. The important thing to remember is that lifting heavier weights for 10-12 reps will provide the best fat burning results; you should be struggling to complete each set. Try this weighted fat loss workouts for men to really feel the effects. You’ll need to aim for 3 sets of 10-12 reps for each exercise with a minute rest between sets. This works every muscle in your body, you can even do it with dumbbells. This exercise works your leg muscles, abs, arms, shoulders, and your neck! Using dumbbells will work your core harder than a barbell as you need to maintain balance. Check this guide out to get the exercise right. It will work your arms, chest, and shoulders. Put simply, the more weight you lift, or ‘push’ upwards; the greater the calorie burn. Building muscle will help to increase your calorie burn even at rest. You already know the benefits of the standard lunge on the lower half of your body. Add in some weights and that benefit will be multiplied significantly. Check out this video guide to make sure you’re getting it right. This simple exercise will simulate the movements of a rower, you’ll feel it on your back, biceps, and even your core. The fact that it works multiple muscles at the same time will boost your fat burning abilities. Here’s your guide to getting started. Squats are another great way to exercise your legs. But, if you add in your weights you’ll increase the effort your legs have to do and work your shoulders and arms at the same time. Here’s the only video guide to this exercise you’ll ever need. You’ve probably tried, or at least heard of the ab roll out. This is an extension of that, using a barbell. The main difference is that you can increase the weight you’re rolling in and out, effectively increases your calorific burn and boosting the growth of lean muscle. Fat loss requires a special balance between diet. Simply eating less food than your body needs will help you to lose weight. But if you're not eating enough, your energy levels could suffer, or worse, your body could burn muscle for energy instead of fat. Your body is built to convert fat into glucose which powers your muscles while you exercise, whether doing normal daily activities or exercising hard. If there is not enough glucose in your body from the food you've eaten this fat conversion process will start. However, your muscles need protein in order to repair themselves and prevent their cells from being eaten. If you don’t have enough protein in your body, particularly after a workout, then your muscles cells are likely to be broken down. This is a bigger problem than simply burning muscle and not fat. Muscle burns as much as 5 times more calories than fat throughout the day. The greater your muscle mass the higher your metabolic rate will be, increasing your fat burning capabilities and helping you to lose weight. This is why it is essential that you eat a reasonable amount of protein, as well as carbohydrates throughout the day. If you’re not sure how much of each of these you should be eating then take a look at the perfect plate eating method. Carbohydrates are essential for the correct function of your body. But, if you consume too many carbs then your body will convert the excess into fat; increasing your weight. You’re probably not surprised to find that you need to reduce your carbs. However, what you may not have realized is that some healthy fat is essential. A great way to keep the balance is to adopt the perfect plate approach to meal times. In a nutshell, this is ½ plate vegetables, ¼ protein, and ¼ carbs; plus a little healthy fat. Processed foods are generally high in sugar and salts. But, they are also full of artificial preservatives and other ingredients that can affect your hormone balance. One of the biggest issues is actually estrogen, the hormone that causes you to store fat. There are many processed foods that contain chemicals which mimic estrogen and will disrupt your hormone levels. Eating a balanced diet should be enough to ensure you’re getting all the nutrients and minerals your body needs. However, it is worth looking at your diet to confirm this. If necessary you may want to get a doctor to check your hormone levels; you can then adjust your diet or supplements to address the issue. It is common to think you’re hungry more often because you’ve started exercising more. However, before you eat anything, have a glass of water and wait 15 minutes. Thirst is often confused with hunger. Don’t forget your body is approximately 60-70% water; it is essential to the proper function of all your internal processes. Drinking a glass is not going to harm you and may just help you stick to your fat loss lifestyle changes. Fasting is a great way to boost your fat loss but you should do it on a day when you’re not exercising. The idea is to minimize your calorific intake to 500 on two separate days a week; this encourages your body to burn fat stores. Avoid eating if you're not hungry. When your body is in ketosis, it is actively burning fat for energy. Intermittent fasting takes advantage of this process by limiting food intake to a specific window. Try alternating days with 18 hours of fasting and a 6 hour eating window. You’ll find it’s much easier to stick to your meal plan and exercises if you have a buddy who is prepared to do it with you. Not only will you be able to motivate each other, but you’ll also find that it becomes a little competitive; which is a good thing! Record everything you eat each day and the exercise you do. This can help you to see where you are making small mistakes and giving into temptation. Also write down your goals, accomplishments, and milestones. Some of the biggest motivational aid you can get when trying to lose weight is the support of other men who have already achieved their weight loss goals. The Fit Father Project has already helped thousands of men to lose weight and even build lean muscle. You can join FF30X today and gain access to the best exercises for losing weight and building muscle, and meal plans. Most importantly, you can share your successes with others. Do this today! Sign up with the FF30X project and share your success stories with others. Their inspiration will, in turn; inspire you. Start your new routine today and become the man you know you can be. *Please know that weight loss results & health changes/improvements vary from individual to individual; you may not achieve similar results. Always consult with your doctor before making health decisions. This is not medical advice – simply very well-researched info on fat loss workouts for men. Are You Gaining Muscle But Not Losing Fat? Here’s 9 Reasons Why! If you're gaining muscle but not losing fat, you want to understand why, right? You're putting in the training hours, and you're watching what you eat, but is that enough? This article is about to show you. I know its frustrating. You're working hard to build muscle, but your physique looks no closer to the image you have in your head. The muscle just isn't showing through. You’re not alone, believe me! I've been there, and so have thousands of other men who've joined the Fit Father Project. The problem is that gaining muscle requires MORE food and losing fat requires LESS food. It sounds counter-intuitive that you could do both at the same time. If you find yourself gaining muscle but not losing fat, you may need to hack the system and go against nature. The good news is that it is possible! Muscles get bigger when you use them. If you push them to their limits, then you will cause tiny tears in the fibers of your muscles. This is a good thing. Your body will heal these tears, making the muscle stronger and bigger in the process. This is why it’s essential to do strength training. Building muscles requires intense physical stress. But that doesn't mean you have to sign up to the gym. The most efficient exercises are ones you can do at home with a pair of dumbbells or a kettlebell. It is important to make sure that your body has enough protein to complete protein synthesis. When you’re lifting weights, it’s recommended that you consume between 1.2 and 1.5g protein per kilogram of your body weight. You should be able to do this through the food you eat, but it is possible to take a protein supplement to ensure you reach your target on a daily basis. You should also be aware that muscles should be rested for between 24 and 48 hours between workouts. This gives them the opportunity to repair and grow stronger, allowing your exercise routine to be successful. The other side of the coin involves losing fat. The most basic way of burning fat is simply to consume fewer calories than your body needs to survive. A calorie deficit will cause your body to convert the energy stored in fat cells into glucose for energy. In the process your fat cells will be depleted, reducing the fat levels in your body. But a calorie deficit can also reduce muscle. That’s why you need to eat enough calories to provide your muscles with the energy they need without overeating. It can seem like a difficult balance, but it doesn't need to be. If your current regime has you gaining muscle but not losing fat, you're probably almost there. You may just need to change things up a bit. So you know you need to eat more than your maintenance calories in order to encourage muscle growth. You also know that you need to consume fewer calories than your body's energy requirements in order to burn fat. While it may seem contradictory, these two goals can be achieved by adopting the right routine. You should be doing some sort of strength training 3 times per week. Add in moderate intensity cardio 3 times per week, for between 30 minutes and 1 hour. Choose something you enjoy, whether it’s cycling, running, or anything else that gets your heart pumping. Make sure you’re getting enough protein in your diet. Experts recommend between 1.2g and 1.5g per kilogram of bodyweight. Consume some protein and carbs after you workout. Fill up on fiber to keep you feeling satiated for longer. Change your eating habits: Calculate the amount of calories you need to consume each day and then eat between 200 and 300 less that amount. Eat more than your maintenance calories, but less than the amount your body really needs for that day. Get enough sleep. Your body needs time to rest, balance its hormones, and repair your body. You should aim for between 6 and 8 hours every night. To help adjust your eating habits, it is beneficial to understand that this is a lifestyle change, not a diet. You can get some meal ideas from this free 1-day meal plan. It’s important to note that building muscle will help with your fat burning efforts, even if the scales aren't going down. Muscle burns more calories at rest than fat does. Having more muscle will increase your calorific burn and help you to burn fat. Eggs – full of protein, healthy fats, and vitamin Bs. Salmon – A 3-ounce serving has approximately 17g of protein! It also has omega-3 fatty acids and more vitamin Bs. Chicken – The breast is also full of protein; about 26g in a 3-ounce serving. Some studies have shown that a high protein chicken diet can help weight loss. Greek Yogurt – As well as protein, Greek yogurts have fast digesting whey protein and the slower digesting casein protein. Lean Beef – Protein, B vitamins, minerals, and creatine are all present in lean beef. Quality is important if you’re choosing lean beef. 90% lean ground beef has 145 calories and 5g of fat. 70% lean ground beef is 228 calories and 15g of fat! Shrimp – Most seafood is good for you, and a 3-ounce portion of shrimp will give you 18g of protein, 1g of fat and no carbs! Soybeans – A great choice if you’re not keen on meat. Soybeans have plenty of vitamin K, iron, phosphorous and 14g of protein per 86g serving. Cottage Cheese – With 28g of protein in a 226g serving this is a great way to boost your protein intake without significantly increasing carbs and calories. Peanuts – One 73g serving has 17g protein, 16g carbs and plenty if unsaturated fat. A small serving every day is a good way to boost your nutrient levels. There are several common mistakes that you need to avoid if you want to boost your muscle growth and burn fat. If you find yourself gaining muscle but not losing fat, you could be making these mistakes. In order to give your muscles the fuel they need to grow, you need to eat more than your maintenance calories. Of course, everything you eat should be healthy food. You need a balance of carbohydrates, proteins, and fats to give your body the fuel it needs to complete your exercises and repair muscle. Eating more than your maintenance amount doesn't mean you should eat everything in sight! It is important to be aware of your maintenance calorie amount and how much you need to build the muscle you’re seeking. This is the maximum calories you consume per day. Eating more than your maintenance amount while working out regularly will simply make you gain muscle and fat. Before and after exercise are the most important times. If you don’t have enough carbohydrates during this period, then your body could break down your muscles with the hormone cortisol, which creates glucose for energy. You need to consume enough carbohydrates to provide your body with fuel, without overdoing it. It’s a good idea to start a food diary. Recording everything you eat will help you to see when and where you are overeating. After a few weeks, you’ll be able to refine your eating plan and even start preparing your meals in advance. Having a proper account will help you to consume the right number of calories and balance your carbohydrates, proteins and healthy fats. Pro tip: Don't feel obligated to eat if you're not hungry. Intermittent fasting is one of the best ways to burn fat. All macronutrients are important. You should be aiming for every meal to have ¼ carbs, ¼ protein, and ½ vegetables. This is known as the perfect plate method. Portioning out your plate with a good balance whole foods is the simplest way to make sure you're getting enough carbs, protein, and fat. The important thing to remember is that not all carbs are created equally. Processed carbs are easily absorbed, so won’t keep you feeling full for very long. Processed carbs also cause blood sugar levels to spike, which encourages fat storage. Refined carbs will release energy more slowly and keep you feeling fuller. You should also be aware that processed foods tend to be high in sugar and other artificial additives. When you’re looking to build muscle and burn fat, you want to minimize sugar and know exactly what you are putting into your body. This isn't possible if you consume processed foods. Some fat consumption is essential for the health of your body, even when you’re trying to lose weight. The problem is that fat is more calorie dense than protein and carbohydrates. At approximately 9 calories per gram, fat has more than double the amount of energy. The trick is to keep your fat consumption to between 20 and 30% of your overall consumption. Protein is the building block of cells in your body. In fact, it is an essential ingredient in repairing your muscle cells. Tiny tears in your muscles are caused when you work out. The repair process is what makes them stronger and bigger. You don’t need to go mad on protein, but you do need to consume enough to provide your muscles with the nutrients they need. If you're serious about gaining muscle and losing fat, you need to weight train 2 or 3 times a week, and it needs to be intense. You have to strain your muscles, causing the micro-tears mentioned above, and allow them to grow. It is important that you push your limits while weight training. You should be aiming for 3 sets of 8 reps for most lifts. The last reps should almost impossible to complete. If you can easily do all 3 sets then you need to increase the weight. Cardio training is essential for burning fat, provided it is at the right intensity. You should aim for between 30-60 minutes at a time and, again, 2-3 times a week. Anything longer than an hour will encourage your body to breakdown muscle cells for food. It’s worth remembering that everyone is different. The secret to avoiding gaining muscle but not losing fat is to keep it varied. It’s okay to take a few days off training, to switch it down, or up. Changing things up will prevent your body from becoming accustomed to the workout, which is likely to cause it to lose its effectiveness. Perhaps the most important tip we can give you is to join Old School Muscle and get the support you need to keep working towards your goal. You can become the man you want to be! *Please know that weight loss results & health changes/improvements vary from individual to individual; you may not achieve similar results. Always consult with your doctor before making health decisions. This is not medical advice – simply very well-researched info on gaining muscle but not losing fat. The science behind nutrition has improved over the years, but the fundamentals remain the same. Diet and nutrition are especially important if your goal is to pack on more muscle. What you eat to gain muscle is not as complicated as you may think, but it does require a little bit of planning and creativity. Getting this stuff right can mean the difference between gaining size and looking defined, or getting big and fluffy. I know you want to look great and feel great, so let's get this off on the right foot. Your goal will be to gain muscle without adding tons of fat. This is a process our team here at The FFP likes to call “lean bulking”. Key Point #1: Unlike on a weight loss program where the goal is to consume less calories than you burn, for muscle gain, you will need to consume more calories than you burn each day. This needs to be a controlled amount though, as just eating lots of food to increase calories will lead to increased fat too. A lot of guys looking to build muscle try following “bulking” diet plans where they eat everything in sight. The result of this approach is usually some muscle gain with A LOT of fat gains. After a bulking phase, guys then need to spend months aggressively dieting the fat off, which leads to MUSCLE LOSS. The net progress of this approach is poor. And, as a man with an aging metabolism, the results of this “bulking” approach will be even worse (even more fat gain). Key Point #2: By planning your nutrition properly, you can and will increase muscle size without piling on tons of fat. You should aim for around 300-500 calories above what you burn each day. If you naturally burn 2,000 calories [use our free calorie calculator tool here] and do 500 calories worth of exercise each day (roughly 1 hour), you will need to consume between 2,800 and 3,000 calories each day for gains. Essentially, getting the right calories on board at the right time will mean the difference between looking bigger and more defined, and looking bigger and “fluffy”! These calories will need to be spread across 5 meals per day, which we suggest as 3 main meals, 1 snack and 1 post-workout shake. You can also make a quick Breakfast Shake following our 20+ breakfast recipes inside Old School Muscle Program nutrition guide. A meal plan like this makes sure you cover all the bases to get your gains, without overloading you so you gain fat. The next step on your muscle building nutrition plan will be supplementation, so below I’ll show you which are the best supplements to take and how they will help. There are lots of reasons to use supplements to secure optimal health and well-being, as well as to aid increasing muscle tissue. As our diets are never fully complete, adding a few supplements can be the difference between normal results and excellent results. 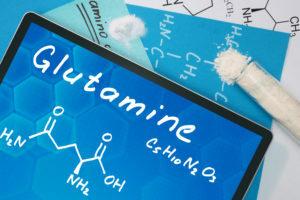 Glucosamine and Chondroitin products – Glucosamine and Chondroitin both natural occur in your body to help maintain healthy joints by repairing damaged cartilage and connective tissue. Omega 3 (fish oils) – Omega 3 fish oil supplements contain fatty acids called DHA and EPA, which studies have shown to aid joint health and help with rheumatoid arthritis and osteoarthritis. Bio-active Curcumin/Turmeric supplement – Curcumin has been cited as one of the most effective anti-inflammatory compounds in the world. Due to its poor natural absorption into the body, however, you should make sure your supplement is bio-active/contains Bioperine. *For localized inflammation, ice packs can be used for 20 mins every 2 hours until the inflammation subsides. Creatine Monohydrate – Creatine is naturally produced in your body to create ATP (Adenosine Triphosphate), which is used as energy for muscle contractions. Supplementing with Creatine increases the amount of ATP available, so increases your ability to contract your muscles at a higher rate. Whey protein – Whey protein contains all 9 essential amino acids and aids protein synthesis within your muscles, leading to increased growth. Due to its fast absorption rate, whey protein is perfect as a pre or post-workout supplement. Casein – Casein is also a type of protein, but the main benefit of this is that it is slow absorbing. This means it offers a steady stream of amino acids for muscle growth over a longer period. This makes it great as a ‘before bed’ supplement. A quality probiotic – Probiotics are live healthy bacteria that help keep your gut and digestive system in tip-top shape. They help to boost your immune system and improve digestive function, among other powerful health benefits. Multi-vitamin – Multi-vitamin supplements are exactly what they sound like. They are a carefully blended source of vitamins and minerals that support the natural functions of your body. Greens powder – Greens powders are a mix of potent antioxidants such as green tea extract, spirulina, and spinach powder. Anti-oxidants are used in your body to reduce free-radicals, which causes diseases like cancer, asthma, and diabetes. Vitamin D3 – Vitamin D3 is produced naturally in the skin when it is exposed to sunlight and can be stored by the body for when it is needed. It supports the absorption of calcium which is used to strengthen bone, support your immune system and maintain muscle strength. DHEA – DHEA is a supplement that supports natural hormone levels, including testosterone, that decreases as you age. Supplementing with DHEA is claimed to support your immune system, help maintain and build muscle and bone, and help slow the aging process. Zinc/Magnesium – Both Zinc and Magnesium are micronutrients that are needed by your body for various functions, including testosterone production. Supplementing with Zinc and Magnesium will support your body’s natural testosterone production. Fenugreek – Fenugreek is a medicinal herb that has been shown by research to decrease inflammation inside and outside the body. It has also been shown to increase testosterone levels and increase libido in men. **We cover all of the preferred brands, dosages, and supplement timing in our Old School Muscle Program. When you're training and eating optimally, you really want to make sure your gains are improving the size and definition of your muscles, right? To make sure you grow your muscles without adding fat, there will be certain foods you will want to avoid. The foods to avoid will fall into categories, which I will explain below. Refined Carbs – Refined carbs are basically anything that is made with white flour, so white bread, bagels, pretzels, doughnuts, sugary cereals, and other baked goods. These types of Carbohydrates contain very little nutritional value (other than sheer calories) and very little fiber content. It is basically a plate of empty calories that do nothing for your body whatsoever. Processed meats – Although some meats are essential to your diet, for protein intake, processed meats like sausages and packaged ham will hurt your ‘lean bulking’ efforts. The high levels of calories, salt, and saturated fat make processed meats a food to avoid when you want solid gains. Alcohol – As well as containing completely empty calories, there is another reason why alcohol should be minimal when you are working towards lean muscle gains. Alcohol consumption increases your body’s demand for anti-oxidants, which limits the amount available to support muscle repair and regrowth. Alcohol (especially beer) also decreases testosterone levels, which makes muscle building very difficult. “Healthy” on-the-go foods – We are bombarded daily with advertisements showing us “healthy” foods that we should be eating, like smoothies, fruit snacks, and granola bars. Most of these so-called “healthy snacks” are nothing more than glorified candy bars – packed with extra sugar and fat that you don’t need. This is just another reason to prepare your own meals in advance. If all you have to do is open the fridge and grab a healthy meal, you will be much less likely to reach for the junk food out of convenience. Fried Food – This one may be obvious, but eating too many fried foods will pack on fat far faster than muscle – due to the massive calorie load and fat content. A high-calorie diet with fried food will increase your body-fat levels, which will cover up any muscle that you have worked hard to gain. It will also increase the amount of fat inside your body, which can lead to health issues like diabetes, CHD, and atherosclerosis. Plus: As we teach you in the hormone optimization section of Old School Muscle, body fat converts your precious testosterone into OESTROGEN, which will also kill your muscle building progress. As well as being consistent with your training plan, it is massively important to stay consistent with your diet plan too. As we have mentioned before, it has been suggested that nutrition is responsible for 80% of your muscle gains. If that’s true, you can understand why it’s so important to stick to your plan, every day! 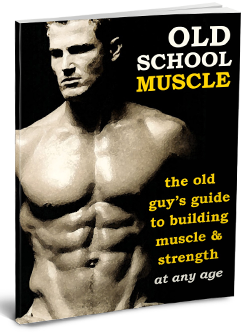 Using a plan like our ‘Old School Muscle’ program will make sure you can stick with it, knowing you are following a proven strategy for increasing muscle mass fast. Stick to protein sources like organic chicken breast, grass-fed beef, lean turkey, wild salmon, sardines, venison, and eggs. We cover how to shop for a muscle building diet inside our Old School Muscle program – along with all the best recipes and supplement protocols. Our main aim with the Old School Muscle diet plan is to make it easy to follow and sustainable for the long term. We want you to be able to change your eating habits, so you can achieve whatever health and fitness goal you may have. Once you complete the 8-week training program, you will have a choice to make. Will you continue to gain muscle size, or will you move to cutting fat further to get ‘shredded’? Pre-exercise nutrition will play a key part in making sure you have sufficient energy before you work out, so you can push your muscles without running out of energy first. Your post-exercise nutrition is to make sure you re-energize yourself and set your muscles up properly to use all the nutrients in your food to increase your muscle size. Your pre-exercise nutrition is to fuel your body ready for the training ahead and to make sure that your blood sugar and glycogen levels are stable. This will ensure that you can complete your training at the desired level without fatigue, or energy drop during it. You should take in a low glycemic index (GI) Carbohydrate between 1 ½ to 2 hours before your training session, with some protein to stabilize your blood glucose levels. Your post-exercise nutrition is used to replenish your glycogen stores that have been depleted throughout your training. The usual rate that our glycogen stores can be replenished is approximately 5%. After exercise, this is raised to 7% – 8% due to our glycogen synthesizing enzymes being extra active for the first 15 minutes following exercise and remaining more active for up to 2 hours after. You should take in high to moderate GI Carbohydrate, combined with Protein, immediately after, or within 15 minutes of completing your workout. The reason you should have Carbohydrate and Protein combined in your post-exercise meals is that this replenishes Glycogen stores more effectively. Protein and Carbohydrate both stimulate the release of Insulin, enabling the synthesis of Glycogen from the available Glucose. A good meal for this would be a post-exercise protein shake. *Please know that weight loss results & health changes/improvements vary from individual to individual; you may not achieve similar results. Always consult with your doctor before making health decisions. This is not medical advice – simply very well-researched info on what to eat to gain muscle.